While the Nigerian government criticises South Africa’s handling of recent xenophobic attacks on Nigerians, the South African Government has deported 97 Nigerians for committing various offences in the country. The property of several Nigerians and other sub-Saharan Africans have been destroyed across South Africa in xenophobic attacks that have been condemned by various governments. While asking its citizens to stop the attacks, the South African government has also blamed illegal immigrants from Nigeria and other countries, as well immigrants who commit crime for the attacks. The government has thus decided to clamp down on such immigrants. 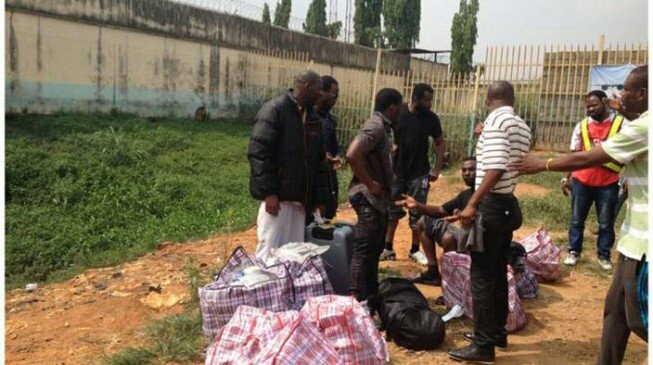 The 97 deported Nigerians landed at the Murtala Muhammed International Airport, Lagos on Monday night in a chartered aircraft with the registration number GBB710 from Johannesburg. 0 Comment to "97 Nigerians deported from South Africa"